Classic Film and TV Café: 31 Days of Halloween: What Lies in the Shadows in The 7th Victim? 31 Days of Halloween: What Lies in the Shadows in The 7th Victim? Mary Gibson, attending a Catholic school, is informed that her sister, Jacqueline, has not paid her tuition in six months. Concerned for her sister, who is apparently missing, Mary travels to New York and discovers that Jacqueline has sold her business to a partner. Additionally, she rented a room above an Italian restaurant, changed the lock on the door and left, returning a few times only to dine and pay a monthly rent. Mary pleads with the restaurant owners to open Jacqueline's apartment, Room 7, where they see a single chair sitting underneath a hanging noose. Irving August, a private investigator, wants to help Mary find her sister (mostly because he was told to stay off the case), but things take a turn for the worse when someone is murdered. Well known producer Val Lewton was hired by RKO Pictures to produce low budget horror films with titles provided by the studio. When the first film, Cat People (1942), proved a hit, Lewton was allowed much control over the pictures. 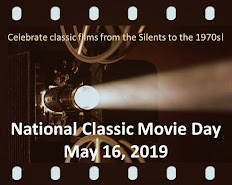 He insisted that the directors cover many scenes in shadows and imply the impending horror, like the attacks in Jacques Tourneur's Leopard Man (1943). But whether or not there was a monster or a physical evil, Lewton's movies all contained a somber ambience and a sense of doom lurking in the dark. In The 7th Victim (1943), there is a feeling of dread throughout the movie. In the opening scene, Mary learns that her sister, her only living relative, is missing. Jacqueline's room represents the way in which she wants to live, as if she could control her life by knowing when and how she would die. She does not want to be unaware of her time of death, but would rather decide for herself. In a terrific sequence, Mary and the P.I. break into the building housing Jacqueline's company. A long hallway leads to a door (which is the only locked room in the building, according to August), and the hallway is hidden mostly in shadow. Without having a clear reason for being frightened, the two debate on who should be the one to continue down the dark corridor. Another great scene is when Mary is threatened while taking a shower. Predating Alfred Hitchcock's Psycho (1960), a silhouette of the character appears on the shower curtain as Mary is harshly told to stop looking for Jacqueline. Mary does learn about what has happened to her sister, but it is best to watch the film knowing as little as possible. It is a movie which thrives on fear of the unknown, and Mark Robson handles the directing reins wonderfully. With Lewton as producer, he also directed The Ghost Ship (1943), Isle of the Dead (1945) and Bedlam (1946), the latter two starring Boris Karloff. 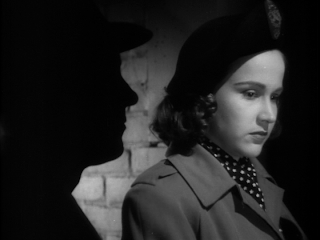 Kim Hunter, in her film debut, gives a strong showing as Mary. Hunter would later earn an Academy Award as Best Supporting Actress for her role as Stella in A Streetcar Named Desire (1951). Sark, I’m delighted that you chose this Val Lewton for our 31 Days of Halloween! First, I think it’s often overlooked compared to other Lewton efforts like THE CAT PEOPLE and I WALKED WITH A ZOMBIE—it’s easily the equal of those classics. Secondly, THE SEVENTH VICTIM is an awesome companion piece to ROSEMARY’S BABY, which TheLadyEve reviewed a couple of days ago—only there’s no humor to be found in Lewton’s masterpiece. It’s a grim tale filled with shadows, those created by light and those harboring within the souls of human beings. As you so vividly describe, the single chair and the hanging noose represent Jacqueline’s view on life…which is truly sad and awful. The chair and noose also create an iconic image that remains long after the film is over. Excellent choice, wonderful review, incredible photos! I think I’ll watch it again this weekend. This is an excellent selection for the 31 Days of Halloween! Val Lewton is a very visual director, with a special gift for using shadow and light. The pictures you posted demonstrate this wonderfully, Sark. I sometimes feel like I am an unwitting character in the story, too, when I watch his films. Thanks for bringing one of Lewton's more obscure works into clear focus for us. Exemplary choice on the night before All Hallow's Eve! The 7th Victim has always been a favorite of mine, even before I realized Val Lewton's body of work. You are right on the money about the atmosphere, shots and shadows, Sark. Lewton's implied horror is so much more frightening than in-your-face blood or gore. In his films, as in the original "The Haunting", nothing is seen but everything imagined, and there is no substitute for individual nightmares. Sark, this is an excellent review. I saw this movie years ago and cannot remember how it ends. After reading about it, I would like to see it again. Sark, inspired by your review, my wife and I just watched THE SEVENTH VICTIM again today. It's even better than we remembered. The use of light and shadows is just amazing. 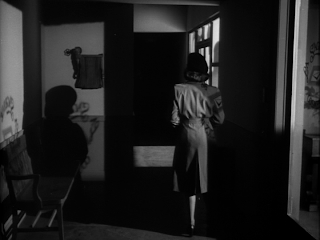 My favorite scene may be where Jacqueline is walking back to her apartment near the end of the film: the falsely-threatening shadow, the knife in the hand, the theatre players--it's an incredibly suspenseful scene worthy of other great "walks" in the Lewton films like THE CAT PEOPLE and THE LEOPARD MAN. Thanks for the comments, all! Becky, I agree about Lewton's "implied horror." I find THE 7TH VICTIM so impressive, because, unlike THE CAT PEOPLE, LEOPARD MAN or I WALKED WITH A ZOMBIE, you don't really know what to expect. What I mean is, it's not as if viewers would anticipate a monster or a physical evil. The audience doesn't really know what there is to be afraid of, but is terrified nonetheless. And as you said, it's much more frightening that way! Rick, I concur about the scene with poor Jacqueline. It was her nightmare come to life. I also loved the scene with Mary and the P.I. in the hallway (hence, my photo still up top). I know my less than stellar review didn't really inspire you to watch the film again, but I appreciate you telling me that anyway! fact that the film let's you use your imagination instead of gore.